I was thinking on friday what is the difference between Bloggers and Youtubers? Sure, bloggers use photographs and youtubers use videos but where is the division in what the content is. So I figured after watching countless 'whats is my bag' videos on youtube that every beauty guru seems to do… why can't a blogger do one. This is the actual content of my bag from a typical day out (minus a cinema receipt that I stuffed in my bag, an after eight chocolate wrapper and a piece of popcorn - I'm guessing from when I went to the cinema on friday, hehe). 1. My purse which is actually a michael Kors wrist wallet that I got in Florida last summer. It's really handy as it fits a lot in, and then if I do want to use it as a wrist wallet rather than taking a bag out it fits money and my card and well as my phone and a lip gloss/stick. 2. Hand products. I always keep hand wipes as there always seems to be something I spill or something I need to quickly wipe up. I also have been recently bringing my eos hand cream with me and a bath and body works hand sanitizer. Then I normally tend to have a nail file (I mean its always a good thing to do on the train). 3. Lip products. 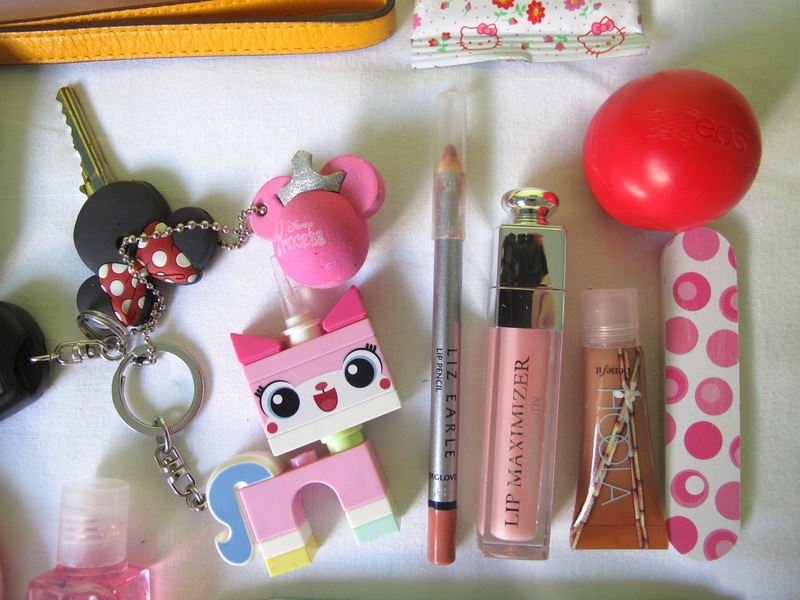 I always have a lip balm in my bag especially in the colder winter months when lips are all chapped. Then I just put in whatever lipliner I am wearing that day. And then lastly I can't leave the house without my Dior lip maximizer lip gloss, I got it at the end of august and now I'm on my second one; I also got my mum obsessed with it, we honestly both live by it. 4. 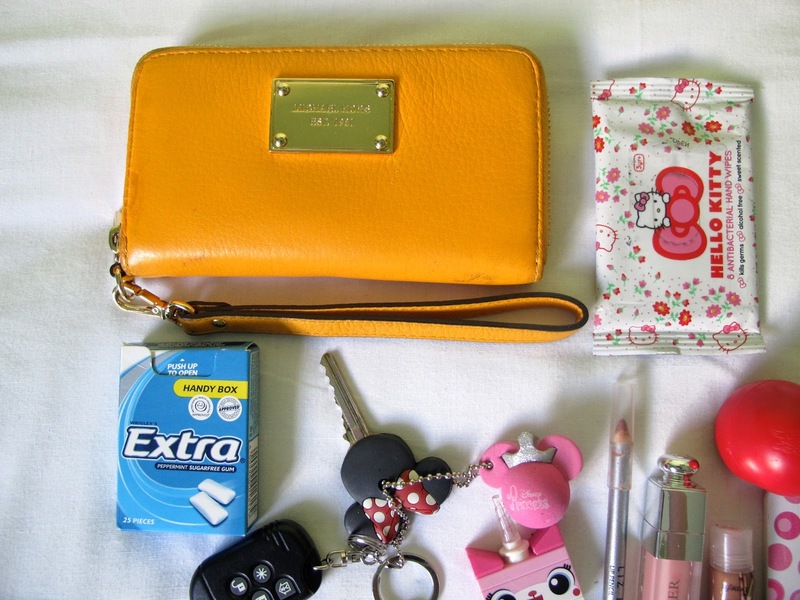 Lastly, all the things that really are essential to any bag; my obnoxiously over - accessorised house keys, chewing gum, a pen and of course my mobile phone. 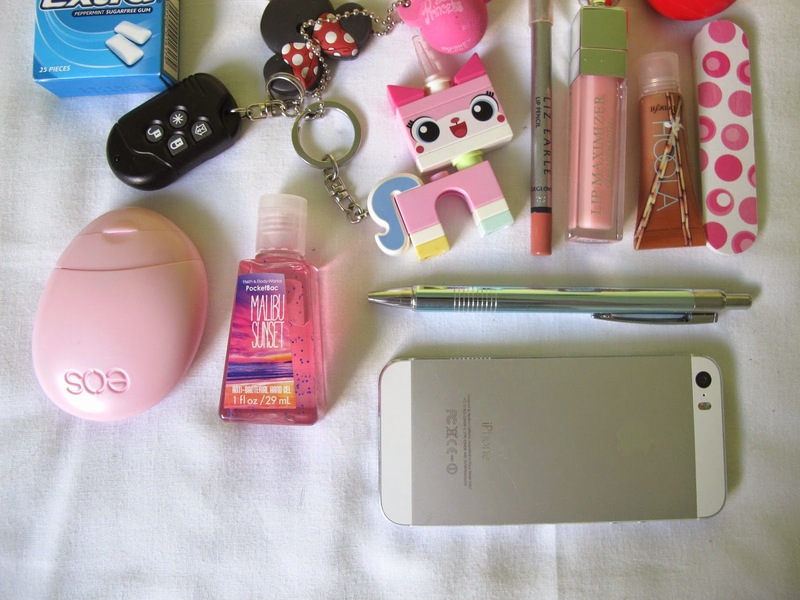 So here's 'what's in my bag' - Blogger edition. that pony thing is soooo cute...!!! Love these posts! Cute stuff! Thankyou Sabrina ! I can't leave the house without my bag, haha. Thankyou !! The colour just adds a nice pop of colour. 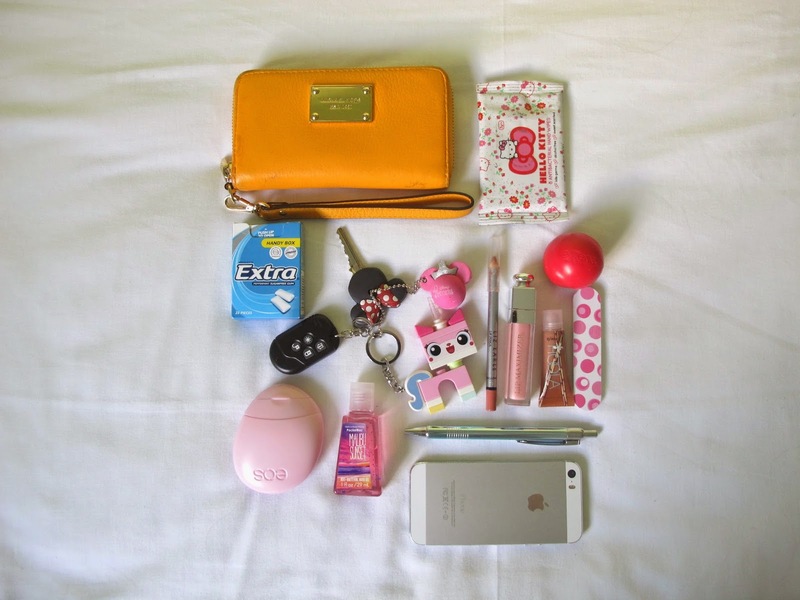 Your bag is super organised! Mine becomes a catch-all for anything and everything so I can totally relate to your wrappers and popcorn! My bag is pretty organised at the moment (it isn't always like thst, haha). Thankyou !! And yes, I thought it would be something different. 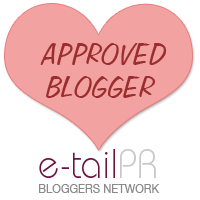 Thankyou for reading my blog. Guilty as charged, haha !! 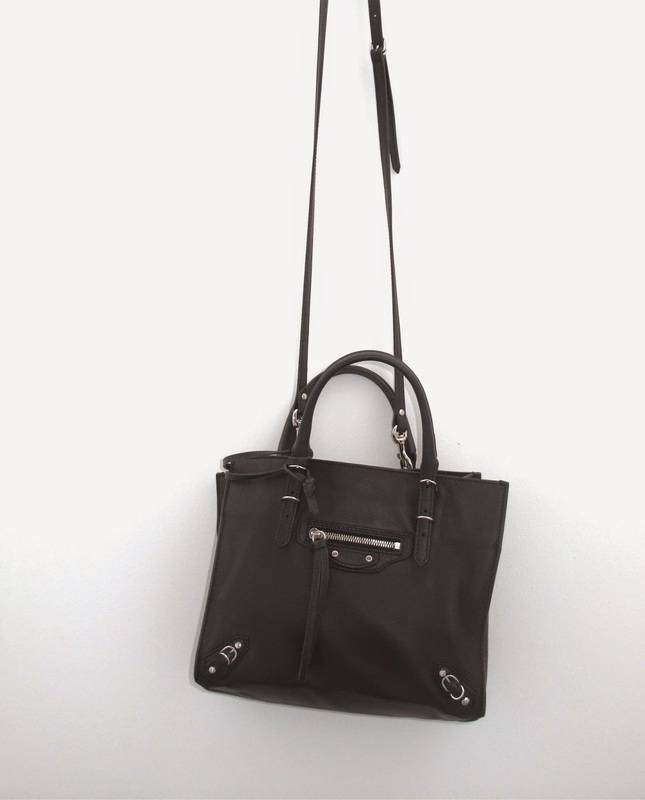 You should Definately look at Michael kors in florida, such good prices !! I hope you have a lovely time.